Erfahren Sie bei einem geführten Rundgang, welche Gebäude Jane Austin-Romane inspirierten, und Sie erhalten eine kostenlose Bath-Karte. 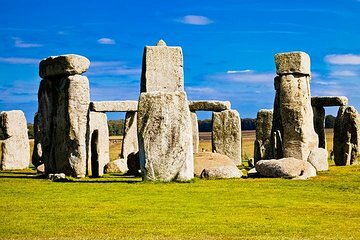 Am Morgen Ihrer Tour begeben Sie sich zum vereinbarten Treffpunkt im Zentrum von Oxford, wo Sie sich mit Ihrem Guide treffen und mit einem klimatisierten Reisebus nach Stonehenge fahren. Stonehenge liegt etwa 113 km von Oxford entfernt und ist ein UNESCO-Weltkulturerbe. Seit Tausenden von Jahren ist es ein wichtiger Wallfahrtsort für Philosophen, Dichter, Neopaganismus und Touristen. Nutzen Sie während Ihres 1,5-stündigen Besuchs den mitgelieferten Audioführer, um Theorien über den Zweck und die Entstehung der geheimnisvollen Stätte zu hören und die Freiheit zu genießen, unabhängig zu erkunden. Weiter geht es nach Bath, einer Postkarten-perfekten Stadt im Westen des Landes, die ihren Namen ihren römischen heißen Quellen verdankt. Hier genießen Sie eine geführte Tour durch das historische Zentrum. Sehen Sie die karamellfarbenen Halbmonde und Terrassen, die Jane Austens Persuasion und die Northanger Abbey-Romane inspirierten. und Fotos von berühmten Sehenswürdigkeiten wie der Bath Abbey, den römischen Bädern und dem Royal Crescent. Anschließend genießen Sie die Zeit zur freien Verfügung, bevor Sie nach Oxford zurückkehren. Ihre Tour endet am ursprünglichen Abfahrtsort. This was a great tour to go on! It was a big, nice air-conditioned coach that took us there. Bath and Stonehenge were both things that I wanted to do while in England, so what better way than to kill two birds with one stone? We had ample time in both Stonehenge and Bath. The guided tour in Bath was really informative, and then we had a couple hours on our own to just walk the streets and explore. Really recommend this tour! This tour was fantastic! Truly the perfect way to see Stonehenge and Bath. The guide was personable and helpful and overall great. If you are booking this tour for the winter months, be prepared for Stonehenge to be COLD and WINDY. Don't let the cold stop you though! It's less crowded in the winter. I took a group of 11 people and we all highly recommend this tour for anyone interested in seeing both places! Tour guide was very friendly, the organization of the group with the bus at each location was very smooth and easy. There was just enough time in bath to eat a great lunch, explore the city, and visit the museum of the Roman baths my favorite part!. A wonderful day tour. A very knowledgeable and fun guide. The bus was on time, both the driver and the guide were pleasant and friendly. Stonehenge was awesome and we were given plenty of time to explore and shop......Bath was an amazing city and our guide was well versed in the history and architecture of the city, again we were let loose and had more than sufficient time to further explore the city, find time to eat and obtain souvenirs. Stonehenge was good but my sister's headset did not work after site2 - too late to return to the building and exchange. Fortunately we were able to share mine. Bath tour was terrible! We couldn't hear the guide unless we were next to him and we ran thru the town. This is on me because I didn't check the necessary physical diligence/strength needed before I booked the trip and my sister is 71. Stonehenge is a bucket list place to see and it does not disappoint. The real gem was seeing the beautiful city of Bath. Our guide was quite knowledgeable on the city's history and must see places. Two buses were loading and it was terribly confusing. Guide lacked enthusiasm. Not a great deal of information was given. Cannot recommend going on the weekend as both venues were terribly crowded. The coach bus to Stonehenge, Bath, and back to Oxford made everything so convenient. When we arrived in Bath there was an entire bus of people that were supposed to follow one guide through the city. This wouldn't have been a problem if we weren't in a bustling city and we weren't all trying to huddle together to hear the soft-spoken tour guide. There were no earbuds or microphone to hear her and she talked pretty quietly. Most people gave up on following her and started their free time early by just leaving the tour. It became very frustrating and we couldn't hear any of what she was saying. A good tour and well organized just unfortunate we had to give up on the Bath tour and do it ourselves. A lot of money spent for being unable to hear just about all of the tour. A great day trip! Lots of time to explore and visit Stonehenge and Bath. Would recommend.